Slide hammer, 1.6KG, 160mm. 2.7KG, 460mm. 5.1KG, 600mm. Pulling claws with fork opening 13.7×18mm, 105mm long, 12.7×19mm, 130mm long. Slotted 1/2" Drive sockets, 6 pt, 100mm long. 25/27/28/29/30mm. 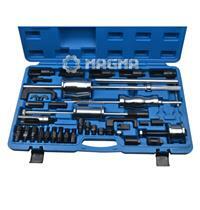 Sleeve design injector extractor with supporting shells, outer diameter 35mm, internal diameter 29mm, M17×1.0 spindle. Pulling adapter with external thread M27×1.0(3pcs) and M25×1.0. 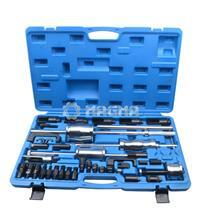 Pulling adapter with internal thread M27×1.0(3pcs). Sliding hammer adapter for inner, outer and claw extractor.